IIn addition to this on-line version, the minutes (without appendix) are attached as a .pdf file. PLEASE NOTE: FIG Office has sent a letter to all FIG members that informs about this online version of the minutes. The letter also includes two new publications and the Annual Review 2017. The letter has been sent on 20 July, so if you have not received the letter by mid August please inform the office. The information about the minutes incl link has also been sent by email to all FIG members. President Chryssy Potsiou opened the 41st General Assembly by welcoming all delegates to Istanbul, Turkey and to this fourth and final general assembly of her 4-year term of presidency. The President expressed her gratitude to members and delegates for their participation. She acknowledged the hard and successful work of the local organisers from the Chamber of Surveying and Cadastre Engineers of Turkey for the Congress. Despite many challenges the local organisers have managed to organise a large and spectacular FIG congress in the beautiful city of Istanbul. The President noted with sadness the trouble that many Africans, and especially Nigerians, have had in their attempt to get visa to attend the congress, even though the local organisers and FIG had done what they could to assist and to prepare the embassies. Unfortunately, too many were not successful and they were missed at the general assembly and congress. The President urged future local conference organising committees to be aware that it takes a lot to work with these visa issues. She did however also note that although FIG works seriously and hard to assist to get visa, still, the final decisions on granting visas is beyond the control of FIG. The President welcomed Honorary President Bob Foster to the meeting and noted several greetings and apologies that were received from member associations and other members. There were special greetings from Honorary Presidents Holger Magel and Juha Talvitie and from Honorary Member Markku Villikka. She also asked for a moment of silence for the passing of Clifford Dann MBE, FRICS, Honorary Member of FIG, who passed away on 19 September 2017. Vice President Rudolf Staiger took the roll call. The roll call was done for member associations only. It was noted that only member associations that have paid all their membership fees to the end of 2017 were allowed to vote at the meeting. A list of member associations that were not allowed to vote was published and posted on the FIG web site 16 April 2018. Some associations have after this date settled their arrears. Appendix to items 2 & 25: Roll Call incl information of the number of votings per member association and members that were not allowed to vote at the General Assembly because of unpaid membership fees for 2017 and earlier. 59 member associations out of 103 were present at this session which is more than one third of the membership needed for the General Assembly to be constitutionally valid. Decision:: The motion was adopted. 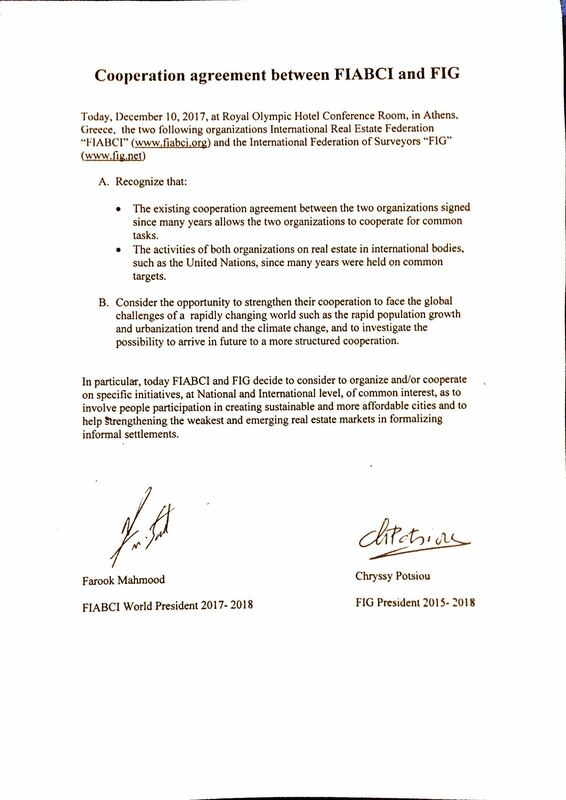 Decision: The motion was adopted, and the membership certificate was handed over by FIG President. FIG office has received payment from Order of Land Surveyors Expert. (O.G.E.F), Algeria, MA-10001 and the association will therefore not be expelled. FIG office has received payment from the association and The Institute of Surveyors Inc. ISSL will therefore not be expelled. from the FIG membership because membership fee has not been received. Mr. John Hohol, President of the FIG Foundation has prepared a report on the FIG Foundation activities from May 2017 to March 2018. He gave a short oral report to the General Assembly. Dr. Christiaan Lemmen, Director of OICRF has prepared a report on the OICRF activities since the General Assembly in Christchurch. He gave a short oral report to the General Assembly. Appendix to item 9.1: Report from the International Office of Cadastre and Land Records (Office International du Cadastre et du Régime Foncier) OICRF. Mr. Jan de Graeve, Director of the IIHSM, Mr John Brock and Mr Jim Smith have prepared a report on the IIHSM activities since the General Assembly in Helsinki. Mr John Brock gave a short report to the General Assembly. The Task Force assesses the progress of establishing the real property markets in the countries with economies in transition. The Task Force is chaired by Pekka Halme, Finnish Association of Geodetic and Land Surveyors MIL. The Task Force is established to strengthen the FIG relationship with corporate members. The Task Force is chaired by John Hohol, National Society of Professional Surveyors (NSPS) in cooperation with Bryn Fosburgh, Vice President of Trimble. Vice President of Trimble. Mr John Hohol gave a short oral report to the General Assembly. FIG Young Surveyors Network is currently chaired by Ms. Eva-Maria Unger, Austria. She gave a status report on the activities of Young Surveyors Network. Each Network Chair has submitted a written report on their Network activities since the FIG Working Week in Helsinki. Each Network gavea short report on the Network activities to the General Assembly. Each Commission Chair has submitted a written report on their Commission activities since the FIG Working Week in Helsinki. These reports include progress reports of the Commission working groups. Each Commission held a meeting during the Working Week on Tuesday 8 May, 17:30-18:30. All commissions reported at the General Assembly on their commission activities. The reports were grouped into three panels and were followed by questions and comments from the delegates. 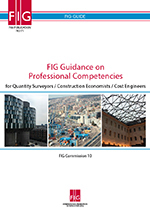 Areas that were commented by the general assembly were: encouragement of commission 9 to include the other commissions in the work of the blockchain technology and use for surveyors; an encouragement to the incoming commission chair for commission 10 to also have a focus on Africa on BIM, since BIM is new in Africa but there is a big interest and engagement; and to encourage work in FIG commission 1 on women in surveying. The prize winners were announced at the General Assembly. Vice President Mikael Lilje presented a draft ToR at the General Assembly for a working group to evaluate the evaluation of the present governance framework and if needed propose changes that meet the future needs and expectations. Council has suggested to leave to the incoming Council to establish this group. Decision: The motion was adopted. During the congress some members expressed interest in participating in the work. Two new FIG publication were presented during the Congress. Vice President Rudolf Staiger presented the report to the General Assembly. This report includes the auditors report from 2017, official accounts (income statement 2017) and balance sheet 31 December 2017, a summary of 2017 accounts, an updated budget for 2018 and proposals for budgets 2019-2021 and proposal for membership fees for member associations in 2020. The profile templates of each candidate and their presentation hand-outs are attached to the minutes. In the first session of the General Assembly each candidate was given equal time (not more than 5 minutes) to introduce her/him and make a presentation focusing on his/her ideas and goals for developing the FIG agenda within the commission. Handouts of the presentations are attached to these minutes. The profile templates of each candidate were attached to theagenda. In the first session of the General Assembly each candidate was given equal time (not more than 6 minutes) to introduce her/him and make a presentation focussing on his/her ideas and goals for developing the FIG agenda to the General Assembly. Hand-outs of the presentations are attached to the minutes. In the first session of the General Assembly the candidates were given time (not more than 10 minutes) to introduce themselves and make a presentation focusing on their ideas, goals and agenda for furthering FIG’s objects and global stature. At the session each candidate was given the same time (not more than 10 minutes) to make a presentation of their proposal and framework of the Working Week and their bid. A total of 88 delegates attended this Presidents’ Meeting. At the meeting challenges facing the member associations and relations between member associations and FIG were discussed as well as experiences from the FIG Congress 2018. A separate memorandum of this meeting is circulated to the member associations. It was noted that only member associations that have paid all their membership fees to the end of 2017 were allowed to vote at the meeting. A list of member associations that were not allowed to vote was published and posted on the FIG web site 16 April 2018. Some associations have after this date settled their arrears. At the second General Assembly 73 member associations out of 105 were present representing 91 votes. Together with observers around 400 persons participated in the General Assembly. Appendix to items 2 & 25: Roll Call including information about number of votes for member associations and members that are not allowed to vote at the General Assembly because of unpaid membership fees for 2016 and earlier. During the Congress, the Council has received one application for member association membership and has decided to bring it to the General Assembly. Decision: The motion was adopted, and the Afghan Surveyors Association received their membership certificate by the President. The decision for the candidates for Commission 1, 3, 5, 6, 7, 8, 9, and 10 took place by blind votes in one voting sheet following the FIG statutes and internal rules with the possibility to vote yes, no or blank. For Commission 2 council has consulted the commission and SSSI, and has appointed David Mitchell, SSSI, Australia. For Commission 4 Council proposed to the General Assembly that Council in consultation with the commission finds a suitable candidate during the following months. Decision: The motion was adopted. The General Assembly also noted the council appointment of the Chair Elect for commission 2, David Mitchell, and the fact that Council will appoint a Chair Elect for commission 4 in the coming months. The elections took place by blind votes following the FIG statutes and internal rules. The elections were done one position at a time. Decision: In the first round Diane Dumashie got 55 votes, Alojz Kopacik 12 votes and Jixian Zhang 22 votes out of a total of 91 votes (there were 2 invalid votes). Because Diane Dumashie got absolute majority in the first round she was elected. After the election of the first candidate there remain two candidates for the second position, and in this election Alojz got 33 votes and Jixian Zhang got 58 votes. The general Assembly elected Ms Diane Dumashie and Mr Jixian Zhang as Vice presidents for the term 2019-2022 after they got the majority of the votes in the elections. FIG President Potsiou thanked all three candidates and their member associations for their contributions and willingness to serve FIG. The election took place by blind votes following the FIG statutes and internal rules. Decision: In the voting, Mr. Brian Coutts got 23 votes and Mr. Rudolf Staiger 68 votes. The General Assembly elected Mr Rudolf Staiger as President for the term 2019-2022. The President thanked Brian Coutts and NZIS for the nomination and for their willingness to contribute to and serve FIG. Decision: In the election Cape Town got 52 votes and Orlando 39 votes.The General Assembly decided that the FIG Congress 2022 will be hosted jointly by The South African Geomatics Institute (SAGI) and FIG and will take place in Cape Town, South Africa. During the Congress the following forums and meetings were held: Member Association Forum, the Director General’s/Affiliate Members Forum, Academic Members Forum, Regional Bodies Forum and Corporate Members Meeting. 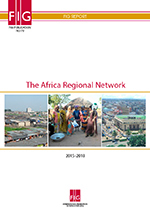 There were reports back from the Regional Bodies forum and Corporate Member Forum. FIG Commissions had their annual meetings, administrative meetings and technical sessions during the Congress. They reported back to the General Assembly on their activities during the Congress. There were no further issues raised for discussion. Representatives from the Local Organising Committee from Licensed Surveyors Association of Ghana and Ghana Institution of Surveyors gave a presentation on preparations of FIG Working Week 2021. Co-conference director Paula Dijkstra from the Local Organising Committee from Geo-Information Netherlands, GIN gave a presentation on preparations of FIG Working Week 2020. Co-conference Director Trinh Anh Co from the Local Organising Committee from the Vietnam Association of Geodesy - Cartography - Remote Sensing gave a presentation on preparations of FIG Working Week 2019. FIG President Potsiou thanked FIG members and participants of the General Assembly. President Potsiou presented at the closing ceremony certificates of appreciation to the members of the local organising committee of the XLI FIG General Assembly and the FIG Congress. Special thanks were recorded the local host the Chamber of Surveying and Cadastre Engineers of Turkey and their past and current Presidents, Ertugrul Candas and Orhan Kasap, as well as to the local organising committee members Muhittin Ipek and Mizaffer Kahveci and to the Co-cngress director Orhan Ercan. There was also a special thanks to the Government representatives and Municipalities that were involved in the planning and executing of the successful congress. At the closing ceremony the FIG banner was handed over by Mr Orhan Ercan, Co-Conference Director of the Congress 2018 to Mr. Trinh Anh Co, Co-Conference Director of FIG Working Week 2019. The FIG Working Week 2019 and 42nd General Assembly will be held in Hanoi, Vietnam, 22-26 April 2019. President Chryssy Potsiou presented her closing address that summarises the findings and the main outcomes of the FIG Congress 2018. The President formally closed the 41st General Assembly of FIG Congress 2018 with the FIG Fanfare.